Yoder's Good Health Recipe®tonic . 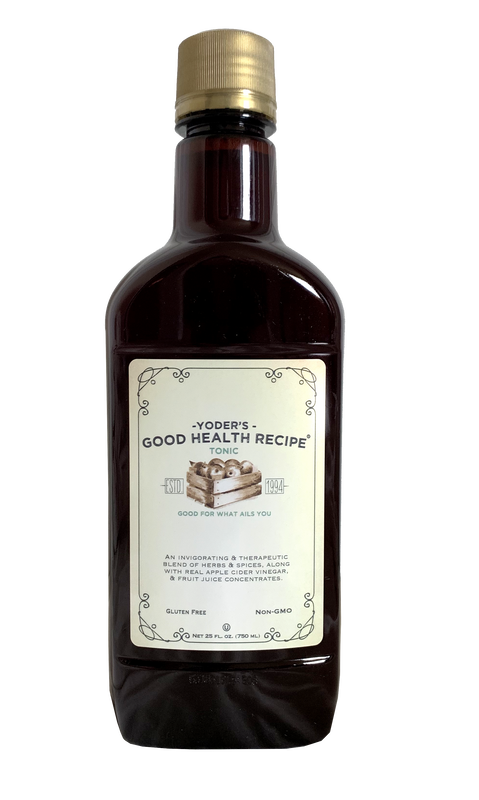 My name is Jayme Maness, I am the Owner of YGHR Sales, the distributor of Yoder's Good Health Recipe® tonic. I'm here to assist you with any questions you might have regarding Yoder's Good Health Recipe® tonic. This product has been in our family since its inception in 1994. Our product is an old fashioned recipe containing aged apple cider vinegar with herbs and spices. Our recipe has been around a long time. We have thousands of satisfied customers using it. It has never been advertised or promoted as the latest "miracle of the month". Our recipe DOES NOT contain added sugars or ALCOHOL. All of our herbs are organic. No pesticides or chemicals are used in their growing or processing. I can give you the best price and guarantee for our product. Our product is found in a variety of stores, from Health Food Stores, Produce markets, Restaurants, Specialty Gift shops, Beauty shops, Bulk Foods stores and even a few Hardware stores. Interested in being a Dealer?﻿﻿ If you currently have a retail establishment and would like to become a dealer, please contact us. You don't need to be a health food store or a market. We have many dealers including repair shops, furniture stores, gift shops, and many other types of stores. Email me or use the Contact Form to learn more about becoming a Dealer.